With the Holidays coming up, the dinning will be considered the most important part of the House. Whether it is for a family gathering or just have a nice dinner, the dinning room will be the most visited room in the house when it comes to the holidays. It is important for your dinning room to look proper and welcoming to the upcoming dinners. 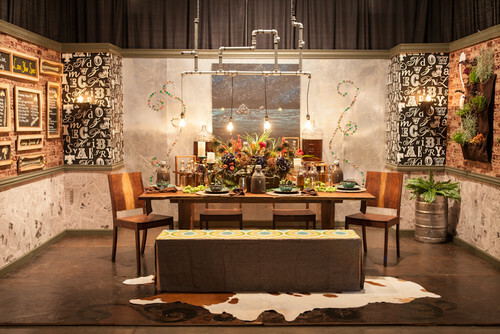 This week we wanted to show a few different examples of what your dinning room can look like. Spaces by Portland Interior Designers & Decorators Garrison Hullinger Interior Design Inc.
Garrison Hullinger covered his dining table in decorative Japanese washi tape in bright, brilliant hues. 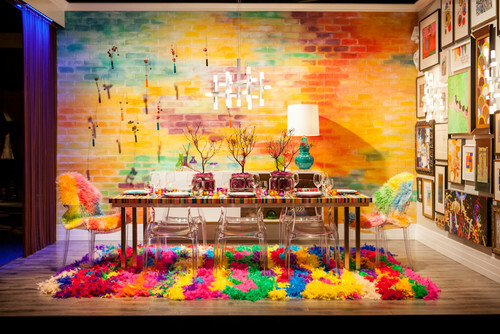 A Technicolor wall treatment and rug and eclectic wall art run with the wild and colorful palette. Portland has a distinct style and ambience, and this room embraces some of the best of it. Reclaimed wood, elements from local breweries and trendy restaurant-inspired features convey the city’s funky blend of old and new. A crafty team of college students from The Art Institute of Portland put their Ikea expertise to good use in this room. The design revolves entirely around wall installations of Honefoss hexagonal mirrors, which reflect the gold light and accents around the space. 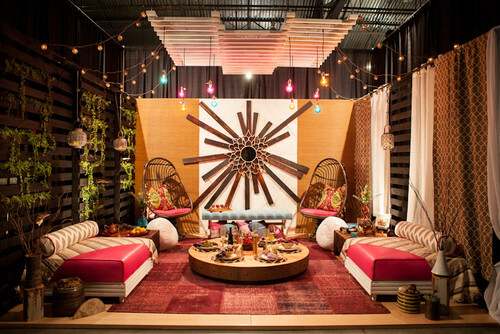 Elements from Morocco and the Pacific Northwest blend in this casual, comfortable dining space. Salvaged, reclaimed, whitewashed and charred local wood (treated shou-sugi-banstyle) covers the walls and ceiling, contrasting with the bright Moroccan-inspired colors. A prized mosaic chandelier found at Istanbul’s Grand Bazaar sets the tone for this colorful Turkish-style design. 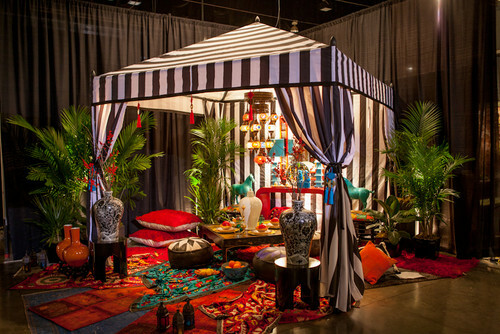 Tulu rugs, plush pillows, pagoda lamps, suzani textiles and Turkish ceramics all come together beautifully underneath a flashy black and white striped tent, much like a pit stop on the infamous Silk Road. Comment below of what you think of these well designed Dinning rooms. 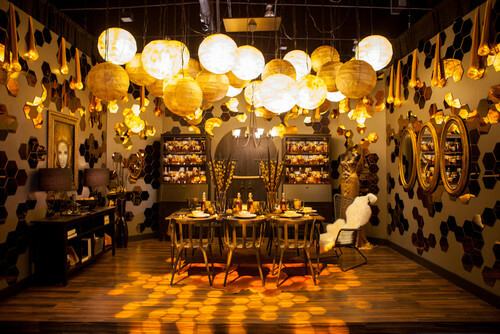 You can also submit a picture of you well designed Dinning room, to be featured in our next Blog!